An international team of scientists have just held a qubit's memory state for 39 minutes. That might not sound like much, but it's 100 times longer than the previous record. It's a groundbreaking achievement that could pave the way to freakishly fast computers. 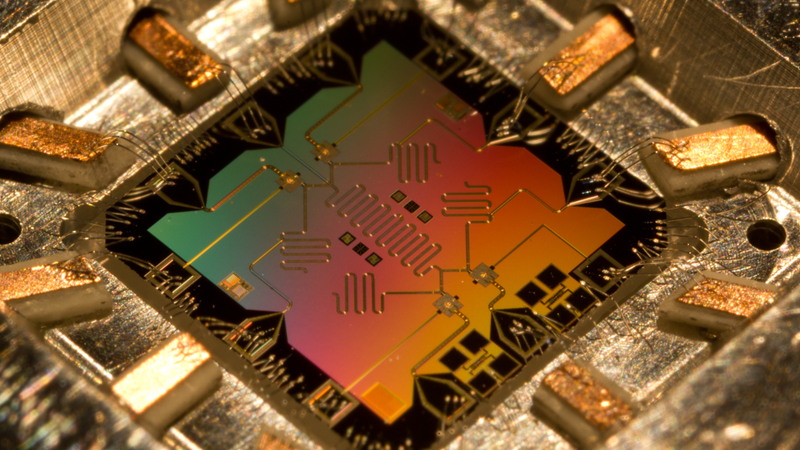 Above: A quantum computer chip. Credit: Erick Lucero. Unlike conventional computers and their "bits" of data, quantum computers use "qubits" as their most basic unit of information. Quantum information processing is done through the use of elemental particles like electrons and photons. These particles, as they change their charge or polarization, can represent off/on messages — the requisite 0's and 1's used in binary systems. Qubits take advantage of spooky quantum effects allowing them to be stored in a "superposition" state, meaning they can be both 0's and 1's at the same time. Quantum computers, therefore, can perform multiple calculations in an instant, which is why they're frequently heralded as the computer of the future. And in fact, Google and NASA have enthusiastically jumped on board the quantum computation bandwagon. But quantum systems are incredibly difficult to measure and operate. They are highly unstable, often "forgetting" their memories in less than a second. Prior to this most recent breakthrough, computer scientists could only hold a qubit in a solid state system for a mere 25 seconds at room temperature. Or three minutes under cryogenic conditions. That's obviously not going to cut it for more larger scale, robust computing. In the new experiment, an international team led by Mike Thewalt of Simon Fraser University in Canada established a new standard for encoding qubits of information into a silicon system at room temperature — and they did so by a wide margin. To do so, Thewalt's team encoded information into the nuclei of phosphorus atoms held in a small piece of purified silicon. They then used magnetic fields to tilt the spin of the nuclei to create the desired superposition state (which produce the desired qubits of memory). All this was done at temperatures close to absolute zero — but when the system was raised to just slightly above room temperature, the superposition states held in place for an entire 39 minutes. In addition, the researchers were able to manipulate the qubits as the temperature rose and fell back towards absolute zero. And they did it all with silicon. But several challenges remain, including the fact that the researchers used an unconventional and highly purified form of silicon. ...[T]he spins of the 10 billion or so phosphorus ions used in this experiment were all placed in the same quantum state. Whereas to run calculations, physicists will need to place different qubits in different states — and control how they couple and interact. "To have them controllably talking to one another - that would address the last big remaining challenge," said Dr [Stephanie] Simmons. Independent experts in the quantum field said the new record was an "exciting breakthrough" that had long been predicted. "This result represents an important step towards realising quantum devices," said David Awschalom, professor in Spintronics and Quantum Information, at the University of Chicago. "However, a number of intriguing challenges still remain. For instance - will it be possible to precisely control the local electron-nuclear interaction to enable initialisation, storage, and readout of the nuclear spin states? No doubt — this is an emerging scientific field, and we still have far to go before we have quantum computers and other quantum-powered devices sitting on our desks. Progress may be slow, but they're coming nonetheless. Read the entire study at Science: "Room-Temperature Quantum Bit Storage Exceeding 39 Minutes Using Ionized Donors in Silicon-28."